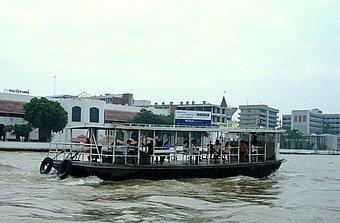 Chao Phraya River ferries provide crossings to Thonburi less the traffic jams, sometimes the ferry boats take you right on the doorstep of the historical site you are visiting. These ferry boats are also a chance to observe the daily lives of people who live on one side of the river and work on the other. Office workers, students, housewives and traders selling their wares make use of these ferry crossings in their daily commuting, the more mundane and hum-drum aspect of river life. Some of the ferry piers are collocated with the regular boat piers others are strictly ferry piers. 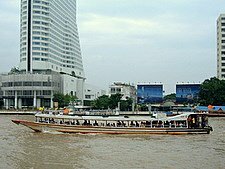 Though the ferry boats in the Rattanakosin area see a number of tourists, most of the commuters on Chao Phraya River ferries are local residents. 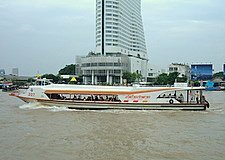 With effect from 25 June 2008, the fares of ferries at small piers on the Chao Phraya River with less than 5,000 passengers per day will be raised. 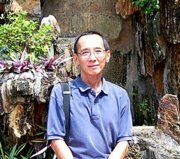 The new fares will be 3 - 4 baht, depending on which ferry you take. It was previously 2.50 - 3.50 baht. The last fare adjustment was in 01 August 2005. 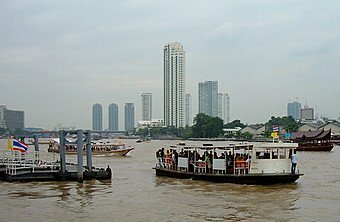 Let's look at some of the Chao Phraya River ferries upriver, starting from the one nearest the Sathon Pier. Note that piers with codes and in this colour are piers for regular boat services and ferries. Piers in blue are strictly ferry piers. Sathon Pier Besides the regular river boats services, the Sathon Pier also has a ferry service to cross over to the Thonburi bank. By doing so you can avoid the traffic congestion at the Taksin Bridge. Si Phraya Pier The Si Phraya ferry pier is between River City and Royal Orchid Sheraton Hotel. Don't confuse this pier with the N 7 Si Phraya river pier which is south of the hotel. 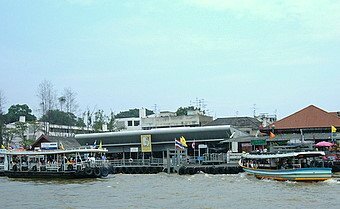 This ferry pier goes across to the Klong San market and the pier of the same name just next to the Millenium Hilton. Klong San market is a local bazaar that sells a variety of clothing, footwear, watches, dolls etc. N 7 Rajinee Pier From this pier cross over the canal to the Pak Klong Talad Pier, a ferry pier that provides crossings from Pak Klong Talad Pier – Santa Cruz Pier – Wat Kalayanamit Pier and back. N 8 Tien Pier behind Wat Pho. N 9 Chang Pier behind the Grand Palace. 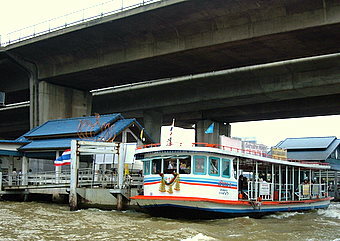 The Chao Phraya ferries berth at separate pontoon piers next to the main pier. There are two ferry boat services here. Maharaj Pier is a private tourist pier. 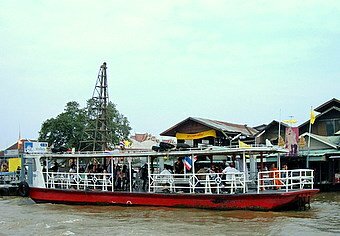 A ferry boat service is provided for patrons of the Supatra River House Restaurant and Patravadi Theater across on the Thonburi bank. The Chao Phraya River tourist boats stop here too. 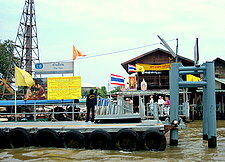 Phra Chan Pier is only for Chao Phraya River ferries. The regular Chao Phraya River boats don't stop here. There are three ferry boat services here. The ferry operating hours vary slightly from service to service. 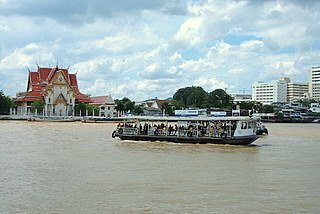 Like the riverboats that ply along the river, the Chao Phraya River ferries play an important role in the daily lives of residents on both banks of the river and a useful means of transport for visitors.